I painted this from a photograph I took over 30 years ago. The "Maheno" served as a hospital ship with the New Zealand armed forces at Gallipoli and other theatres of war in WW1.After surviving the war the "The Maheno" operated as a cruise ship traveling between Sydney, Auckland and Vancouver on a regular basis. In 1926 after being sold to a company in Japan for scrap metal whilst under tow for her final voyage she snapped her tow line during a cyclone and ended up on Fraser Island where part of the wreckage can be seen today. 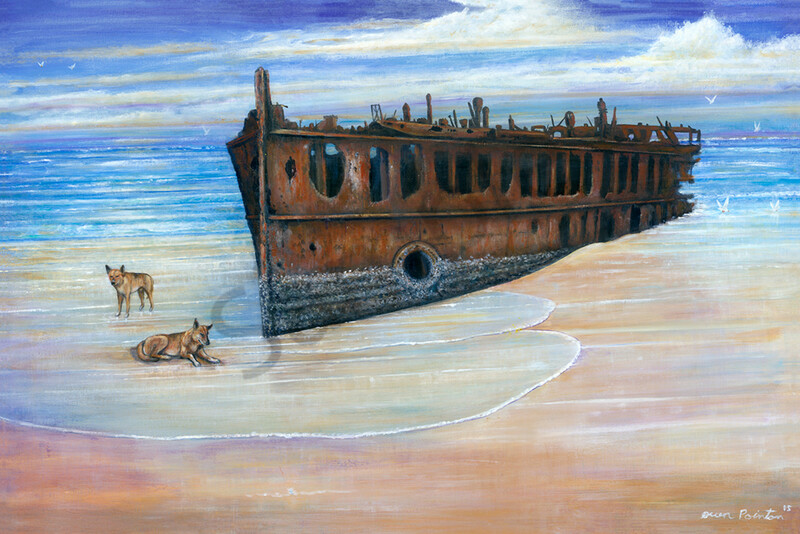 Dingoes are often seen around the wreck as if on guard duty .